A man has been able to control a robotic limb with a mind-reading chip implanted in his brain. It allowed Erik Sorto, from California, to sip a drink unaided for the first time in 10 years. The details, published in Science, reveal how complex bursts of electrical signals in his brain could be interpreted into commands for the arm. Experts said the results made brain-controlled robotics closer to being a reality. Mr Sorto was shot at the age of 21. 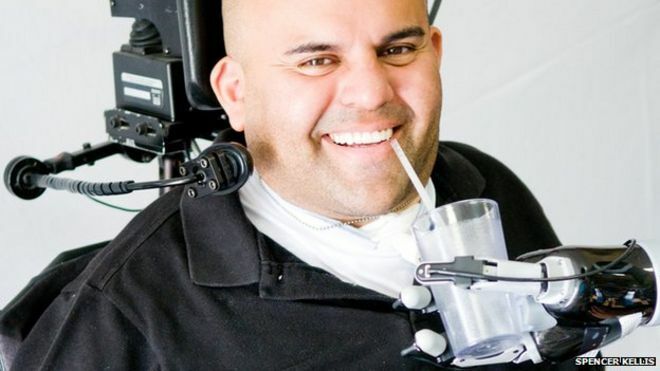 The damage to his spinal cord left him paralysed from the neck down. Two tiny sensors were implanted into his brain to monitor the activity of around 100 neurons. Previous attempts at thought-controlled robotics have focused on the motor cortex – the region responsible for the action of individual muscles. However, the US team tried implanting the chips in the posterior parietal cortex – the part of the brain that comes up with the initial intention. It is the difference between deciding to pick up a mug or telling your hand to move towards it. The team hopes this approach will be more intuitive. He has improved with training so that he can lift a drink to his mouth and also control a cursor on a computer screen. Mr Sorto said: “I joke around with the guys that I want to be able to drink my own beer, to be able to take a drink at my own pace, when I want to take a sip out of my beer and to not have to ask somebody to give it to me. The field of harnessing a healthy brain to overcome a damaged body is advancing rapidly, particularly in the US. Cathy Hutchinson used a robotic arm to serve herself a drink for the first time since her stroke 15 years previously. Jan Scheuermann was able to deftly grasp and move a variety of objects just like a normal arm. However, the developments are still largely restricted to the laboratory. The procedure still requires an implant with wires coming out of the brain, which could be an infection risk. Scientists also want to monitor even more brain cells to improve control. 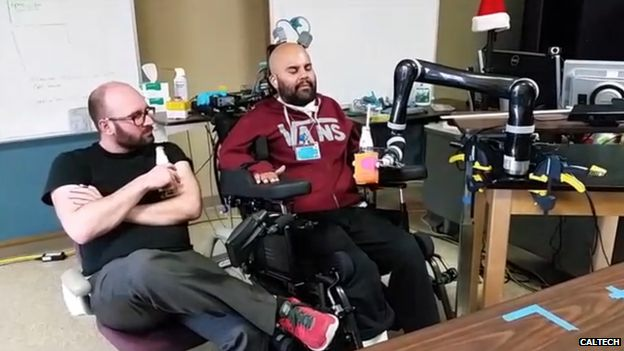 A commentary, from researchers Dr Andrew Pruszynski and Dr Jorn Diedrichsen, argued: “The results represent one more step toward making brain control of a robotic limb or computing device a reality.